Looking for some great gifts for foodies who also like to play chef a few times a week? The selection of great gifts will make shopping easy, especially when it comes to buying Christmas gifts. In fact, wrap them well and these gift ideas will have you looking thoughtful and mature. And if you’re lucky, your loved one will probably go ahead and add even *more* great food to your life. Trust me, it’s always important to show a person who cooks for you that you appreciate them. We hope that this list makes it easier for you to find the perfect gift for the foodie in your life. You’ll also tell that person who spreads joy with their food that they are truly an important part of everyone’s lives. This cookbook holder is super-nice and great for that chef that’s been holding on to their paperback cookbook collection for a number of years. Keep cookbooks clean and safe in this cookbook holder. The salt plat can be used on the grill, in the oven, or even in a larger model electric grill if you know what you’re doing. Add flavor (and zest, too!) to your salmon, steak, or even veggies like asparagus. This salt plate is a LOT of fun because it’s so easy to use and experiment with. That’s what makes it one of the top gifts for foodies in this article. This is a great gift for any foodie who loves to add herbs and seasonings to their meals. Fresh herbs are always best and this kit makes it easy to have them available, no matter what the occasion. Is there a foodie in your life who is all about Italian food? You know who I’m talking about — they live to eat at Italian restaurants and tend to buy the freshest refrigerated pasta available at Whole Foods? Making homemade pasta has a lot of benefits; you can add spinach or choose to make your own pasta from a gluten-free recipe. Consider buying this for a foodie friend who loves to cook but may have some dietary requirements when it comes to pasta choices. This is a great gift for foodies who love to cook meat or fish. You can also use these spices or rubs on veggies, of course — it’s up to the user’s creativity. Highly recommended as a gift for foodies who love to barbecue outdoors year round. Or, of course, anyone who needs to spice up their meats or fish for oven-baked main courses. These are just 5 great gifts for foodies. Didn’t find what you wanted? 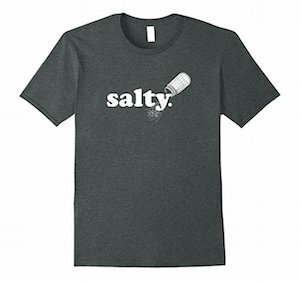 Check out these great t-shirt gifts for chefs. You’re bound to find something perfect.